My Trombone Concerto was originally written in 1979 to a commission from Bedfordshire Education Service, for a new work for Michael Hext, winner of the first BBC Young Musician of the Year competition. This version for brass band was commissioned by Nicholas Childs, Music Director of the Black Dyke Band, specially for Brett Baker, the then principal trombone of the band. 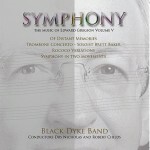 He has recorded it on the Doyen label with the Black Dyke Band.